Jim Will, the father of a missing man from Sequoyah County, Oklahoma, offered a $10,000 reward earlier this month (Jan 5) for any information leading to the arrest or conviction of persons involved in the disappearance of his son, Judge Will. Jim told reporters at Oklahoma’s KFSM-TV that he does not believe his son is still alive, but is still desperately looking for answers. 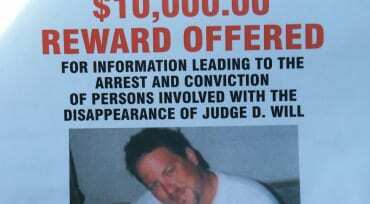 Will was 39-years-old when he went missing in March of 2014. “He was at his residence with two individuals and during the interview with those individuals, they say he went outside on the back porch to use his phone and never returned,” Sequoyah County Sheriff Ron Lockhart told KFSM reporters. The area where Judge Will went missing is a densely wooded area that extends more than 500 acres behind his property. “Me and some close friends have been out here on four wheelers searching all the hills back behind here, and all the ravines, and roads multiple times in the past two or three days,” Judge’s father, Will, told 5News reporters shortly after his son’s disappearance. Sheriff Ron Lockhart says that investigators do have persons of interest in the case, but declined to release any names. It’s possible that the individuals who last saw Judge Will are still persons of interest in Will’s disappearance. Curiously, Lockhart also said that several months ago a woman at a local convenience store told someone that she might know where Judge Will is buried. The area was thoroughly searched and nothing was found, however, Lockhart did say that the woman’s statements led investigators to additional information in the case. According to Lockhart it is still not clear if there is any foul play in the disappearance. However, he did tell reporters that its possible that the last two people to see Judge Will know something. “Those two individuals could be lying to us; we don’t really know, but we feel like there is more information that is being withheld,” Lockhart said. Anyone with any information is being asked to contact the Sequoyah County Sheriff’s Department at 918-775-1213.